Added on June 25, 2013 by Angela Serino. Places: Stedelijk Museum Bureau Amsterdam, Goleb, Zina, Studio Amsterdam and the Japanese Restauant Hakata Senpachi. noalanguageschool is a project developed by curator Angela Serino and artist Mounira Al Solh and supported by a research grant from the Mondriaan Fund. Artists and participants: Mounira Al Solh, Martine Neddam, Fadi El Tofeili, Lawrence Abu Hamdan, Francesco Bernardelli, Marianna Maruyama, Grupa Spomenik/The Monument Group (Jelena Petrović and Jelena Vesić), Ahmet Öğüt, Marie Frampier, Esther Kempf, Anna Dasovic and Sarah Jones, Nicoline van Harskamp. Credits image: Presentation at SMBA, with Angela Serino and Nicoline van Harskamp. noa language school is attempting to create a different approach to language education, starting from the experience of living (in)between two or more languages. 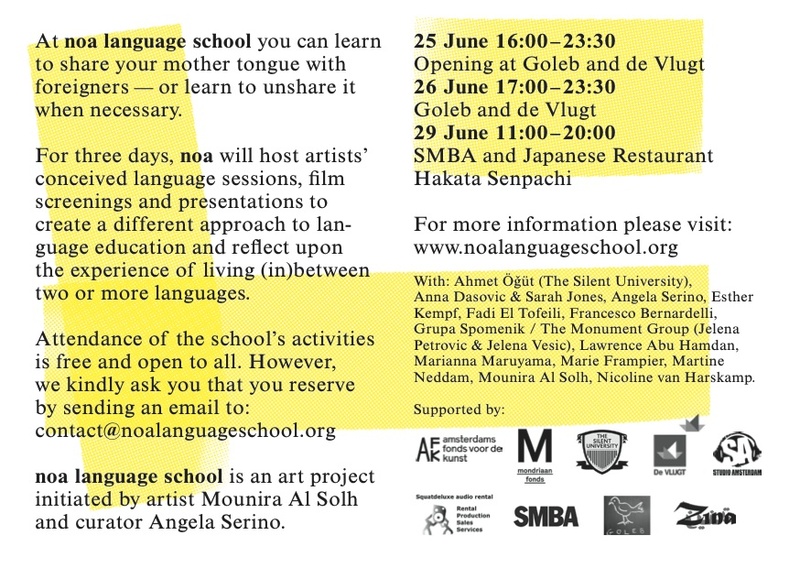 noa language school is led by artists who invite the public to learn or unlearn existing or artificial languages, as a means of exploring and creating other selves and an alternative sense of community. At noa language school you can learn to share your mother tongue with foreigners—or learn to unshare it when necessary. noa allows you to explore the use and comprehension of languages from different sides and positions. Throughout the various sessions that make up this three-day school, artists will stage expert talks to train the ear of Dutch people listening to the broken Dutch spoken by immigrants; a writer and an artist invite us to intimately learn Arabic words by describing the sounds with the help of an Italian opera singer; and Moroccan ladies will physically train us, moving our jaws to help us repeat the words they use to describe Dutch people. 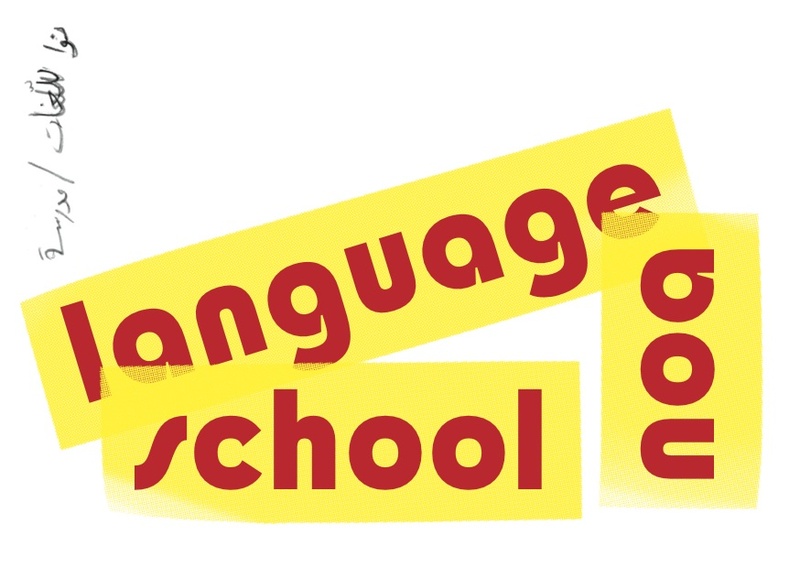 noa language school Amsterdam was made possible by the financial support of Amsterdams Fonds voor de Kunst, SMBA, Squat Deluxe. Here below you can read some of the comments of the participants to our activities. “I was very insecure, thinking what can I teach to those artists? But the round table worked very well, they all listened to what I said with a lot of interest, and I enjoyed their stories of moving in or out in different countries. The conversation took a philosophical turn at the second half of our talk…” Kenneth Chin Sue (works as a transportation car driver in Amsterdam). "Tell me a story you don’t know", Anna Dasovic and Sarah Jones, performance, SMBA. Photo credit: Melanja Palitta, Igor Sevcuk.